Here we are at the first WOYWW of 2017 and I must first wish you all a very Happy New Year and hope we can all enjoy many more link-ups during the next year. Wednesdays are one of my best days of the week....because I love seeing what you all do each week. So? What's on my desk today? I started off my creative new year with a new project I'm working on. 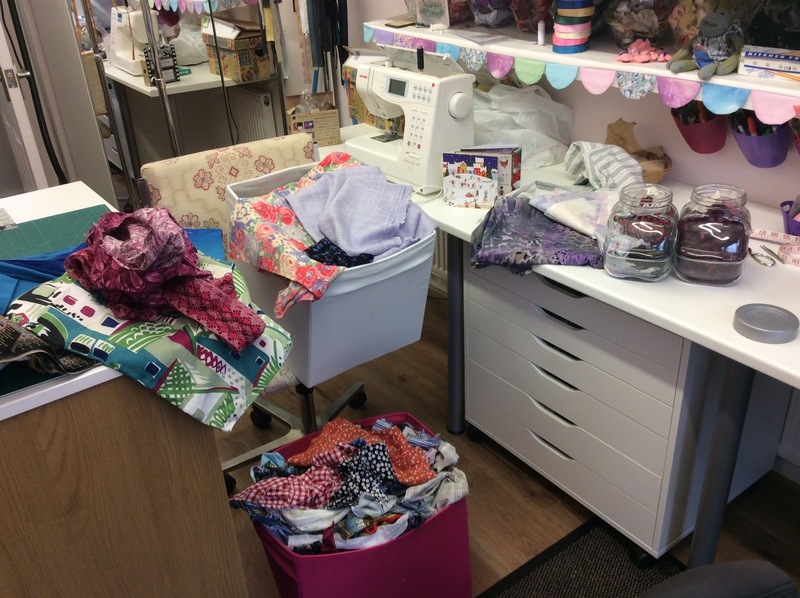 My memory bears have proved very popular and I have had enquiries about making some memory cushions so out came my fabrics to make a few up as ideas...and to see how long they would take for costing etc. First one I made is from a man's shirt with a pocket on the front to hold a remote control. Next was made with a lady in mind. 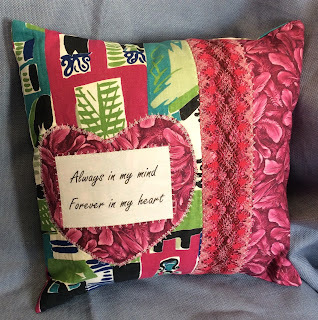 I've mastered printing on fabric now so can add a sentiment to the front of each cushion. The next was made using some babygro fabrics to remember a little girl when she was very tiny. I've really loved making all three cushions and have already had a lot of interest with orders so fingers crossed they will sell well. That's all I am sharing for this week. Please leave me a little message to tell me what you think and I will pop over to yours as soon as I'm able to check out your desks. Your cushions are adorable and I think they are a super idea. I especially like the male one the pocket for the remote is the best idea as most men seem to be like mine - love to be in charge of the remote! Hope they take off, cannot see why they won't as hugging a cushion is such a comfort, almost the same as a bear but without the younger aspect that some might see. Happy New Year, Annie. What cute little cushions - a grand idea. Well done. The memory cushions are such a lovely idea and, like Shaz, I think they will be very popular. My friend made a very special quilt for her Aunty, using her Uncle's shirts after he passed away, and it gave her great comfort. OH my these cushions are gorgeous & what a wonderful idea - my favourite is the first one, the man's shirt. I am new to WOYWW & already I feel so encouraged by all the ideas I am gleaning! Happy 2017. 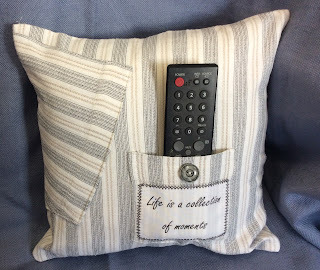 Love the cushion with the remote in I am forever losing my remote control. Think you have a really good business idea here pursue it. Saw two women on Dragons Den with a similar thing they got offers from all the dragons. Hi Annie, love, love, love your memory cushions! They are such a lovely idea and I being able to print sentiments on to fabric makes them truly individual. The one with the remote had me chuckling - the EM and I both have a remote each which saves any arguments - well, most of them anyway :) It isn't just the fabric that makes a lot of dust in my craftroom, all that card and paper sends up loads of fibres too! PS: seems we have all moved up one digit on the linky thing. 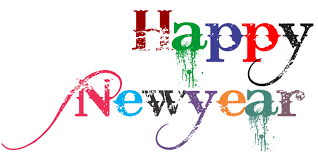 Happy New Year, Annie, hope it's a good one for you. What a great idea your cushions are and so beautiful. The sentiments make them very special. I bet they are going to be incredibly popular. Those cushions are just wonderful! I would buy one in a heart beat if I did not live so far away. Another brilliant idea! 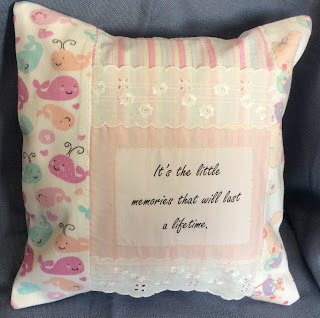 I have always stitched a cushion for the new babies in my family so memory ones are very thoughtful. Well done Annie, ckevr work on those cushions thought the pocket with remote was very clever, ingenious. Have a healthy 2017.
missed visiting last week, but LOVE the memory pillows. Glad you can now print on fabric. I've done it very few times, used adhesive backing, which is hard to find here. Have a great week.